My goal is to measure RC-receivers RSSI pin with atmega328p and send the Received signal strenght to computer using UART with the help of FT232. Signal always stays up about 500us and then drops to 0.7V for a while, but only after that I am interested of the signal level, becaus that is varying by the signal strenght. EDIT: Signal is up when Rx is off. The Rx is turned on little earlier than Tx, so the 0.7 level is the noise level. Then the Tx is turned on and the connection is so good that the level goes to zero, but if there is very bad connection the level will be closer to noise level. That is the simple explaining to the behavior, but it is lot more comlicated. So I want to measure samples from the last period of signal and do some calculation for them, but my problem is how to trigger the ADC or should I use continous mode. I was thinking could I put my signal also to Input Capture pin and with auto trigger start the adc when there is rising edge and then store only the data after 1ms-> 1.4ms. Thank you in advance for your tips! Sound like a rather bizarre way to give RSSI?! Are you sure you're looking in the right/best place? So how, exactly, does it "vary by the signal strength" ? It might help to know what radio your using! also a link to any documentation you have. eg, how do you know that this is the RSSI signal ? is it a AM or FM signal? I am using Turnigy Hobby King 2.4Ghz 4Ch V2 Tx and 9X 2.4GHz 8Ch V2 Rx which both uses AMICCOM A7105 chip. 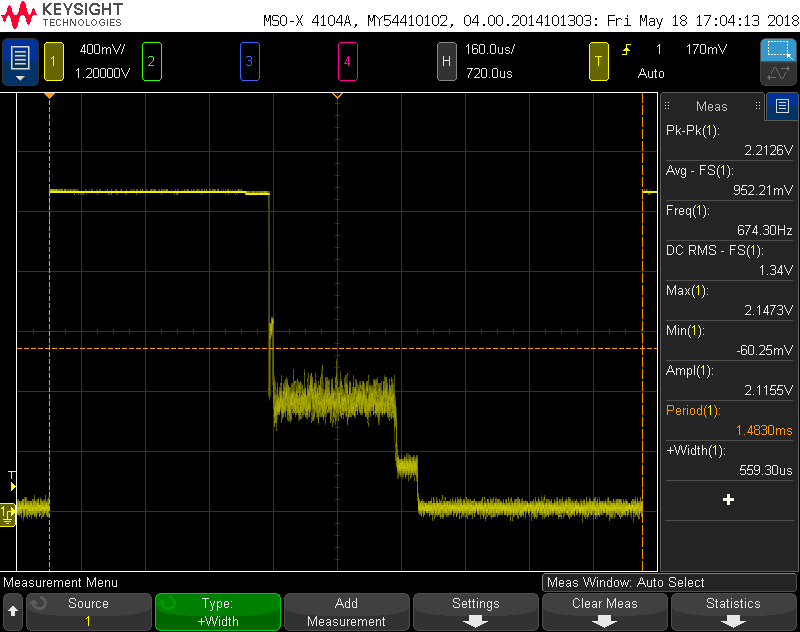 I have measured the RSSI straight from the RSSI pin from the RX A7105 Chip (Pin 1 as the datasheet says). You will need to low pass filter the signal, the modulation give some noise to the signal. Or is this two radio's that make a communication, where you just listen? on 2.4GHz there is all kind of noise your radio will see so perhaps make a ring buffer there always sample and when you receive a correct packet then look in the buffer to see how good the signal was. looking at the DS link provided, it chip has a digital RSSI value available, why not use it? The RSSI pin is intended to be connected to the AGC cap to provide a filtered AGC voltage to the IF stage in the RX, it's not meant to be used as an RSSI output. The chip has an internal ADC to read the RSSI at the proper time and provide a digital value. I have do some more measurement and it is even compicated signal that I thought. The radio is frequency hopping and the frame I have took picture is just one frame and there is 16 frames which can be little bit different. My best measurement way at this far is the average minumum value that is about 30mV when very close, 40mV when 10m away and 400mV when 100m away and when the Tx is out of the range the signal changes totally. There are two main types of frames and I have to figure out why they are like that. Also to the digital RSSI value, it would be useful but it is hard to get out from the A7105 chip. Not any harder than sending and receiving data, and certainly easier than burning CPU cycles doing signal processing. Show us the code/library you're using and we'll help out. Can't help wondering if BER is a much more important indicator of (digital) signal condition than signal strength? (certainly is in other digital radio systems such as satellite TV reception). I'll bet the chip has registers for bit error rate too. Hello and thank you for your solutions! BER would be also good but I will be staying RSSI for now. The chip is very small and I was not able to solder straight to the chips legs anything so even that restrict my actions. Luckily the RSSI pin was soldered to the capasitor where I managed solder the wire. I have done much more measurement and got some new information about the behavior of Tx and Rx and the RSSI signal. I desided to use continous mode ADC and send the raw data straight to computer and then do the calculating by computer. Now I have got the program working. Now it is continous saving ADC values to 'ringbuffer' and when matlab calls values, it stops the ADC saving and sends the buffer to matlab. After send is ready it continue saving data to buffer, but I need to wait until the buffer goes one round before I can call new values. Another option would be reading and saving data at the same time to the buffer, but I havent thought how it would work. My code is based on Benn Thomsen Continuous ADC Capture code. My problem is that I am using atmega328P so I can have only 1024 bytes ringbuffer and for my apllication I have to use smallest sample rate, so I can get enough long sample in one buffer. I think i will by Arduino Mega board so I can use larger ringbuffer and so on higher sample rate. don't wire a pushbutton to an external interrupt! Maybe you've found out already that the button doesn't always work as expected. Pushbuttons bounce and give multiple interrupts per press. Yes that's true Kartman, but the push button is rarely used in this project (I did it for fun, just so I can turn it off when I go to lunch ), so it does not matter much (And I can always check from the led is the ADC on or off. What does matter is when the buffer goes round, there is some strange happening, maybe few measures skipped. But I think I will consentrate on prosessing the data until I get my Ardruino Mega board. By the way, I am using external VREF for ADC and I did it with voltage divider from the USB VCC with two 1Kohm resistor to get 2.5V. Is there a better way you suggest or is it "good enough"? EDIT: I didnt wait enough time in matlab so the buffer didnt have time to go around. I noticed mega has 4 USART so I had to rename ISR(USART_RX_vect) -> ISR(USART0_RX_vect), but I think other names should be the same. My USART connection was not working and the ADC Didn't work. Code should start continous ADC and ISR function saves the value to buffer and everytime buffer gets full, led will change state and ADC strats from the beginning of the buffer. But I figured out with the led that code will never enter the ISR(ADC_vect) or ISR(USART0_RX_vect)? but I think other names should be the same. I would not have thought a port from 328 to 2560 is as simple as changing the name of one ISR vect ! There's quite a lot different between those two chips so you need to look at every bit of every register of every peripheral you are using and find any change in behaviour and amend accordingly. This is one of the many ways Arduino is "better" than plain C. It hides all the differences in "cores" so as long as you only call hardware adaption functions in the core it just works (and that can even involve a move from AVR to ARM!). as soon as you start hitting the silicon directly then when you move from one device to another you have to "port" any changes. Yeah you are rght clawson that it is not so easy and It would have been easier to write whole thing new by arduino code, but I am not familiar with it so I tried plain C.
I have browsed the datasheets and there are many differences, but the basics and the names are pretty much the same. 2560 has little bit more possibilities in ADC but it has all the same register than 328, and pretty much same with the UART. "pretty much" the same is not good enough! They need to be either exactly the same, or you have to do all the work to take care of all the differences. Because you have missed something! As ever, the best approach is probably to take it little-by-little, getting one small part to work at each step - rather than trying to port the entire thing in one go. Don't suppose you have access to an ICE? Should the interrupt vector in dependies be the same as in datasheet? Datasheets first vector is reset vector, what is not in dependies, so every vector number is missmatched. Should the interrupt vector in dependies be the same as in datasheet? Datasheet says ADC is vector 30 but in dependies is said #define ADC_vect _VECTOR(29) Datasheets first vector is reset vector, what is not in dependies, so every vector number is missmatched. I have been testing simple codes for mega2560 and I figured out that once the interrupt should occur, the code jumps to start of main and continues until sei(); and jumps again into start. I was going to use ring buffer to store the ADC data and send it to computer and I did some calculations if the samplerate would be 10k SPS and one sample is 8 bits and then there is 1 start and 1 stop bit so the frame is 10 bits. So the buffer to work I would need 10*10k = 100k Baud rate? and is that achievable easily? That is you have enabled some interrupt for which you have not provided an ISR() so it goes to "bad interrupt" which does a JMP 0 and restarts the AVR. This will happen as soon as you sei() and as soon as the interrupting event then occurs. data to computer if my ADC samplerate is ~10k SPS. If you send binary then it is 2 bytes for a reading (I assume 10 bit not 8 bit?). Each byte takes 11 bits with 8N1 framing so you need to send 22,000bps so any baud rate above that should allow you to do this. But still looping/jumping to main... even added ISR vectors to EMPTY_INTERRUPT(); but it didn't help. Tried to look for the dependencies files, but I didnt't find anything suspicious. It is not relevant but why does it take 11 bits and not 10 bits? Actually I take only 8 most signifigant bits of the ADC result to get data faster to computer. 8N1 is only 10 bits. If you set the serial to 115200 baud, then youcould achieve your data rate. Why did you need to fiddle with interrupts? The Serial driver should work with any fiddling. The Serial driver should work with any fiddling. What do you mean by serial driver? I thought I would need ringbuffer, because my ADC sample rate is so high and thats why I thought I would need interrupts, but if I increase UART baudrate enough, would it be possible just polling the ADC result and always when it is ready, sending it via UART and forgetting interrupts and buffers. But clawson has shown that your sample rate is not particularly high - relative to common UART baud rates! Also note that if you were close to the limit then it's actually more efficient to simply poll the thing and shove the bytes just as soon as UDRE. Using an interrupt introduces something like a 20..30 cycle overhead per byte for all the effort involved in getting into and out of an ISR. Also the fact that you say 8 not 10 bits (which for UART really means 1 byte not 2) means that my estimate above was conservative - you can achieve double the rate if it is (effectively) half the amount of data to be transmitted.
" samplerate is ~10k SPS. If you send binary then it is 2 bytes for a reading (I assume 10 bit not 8 bit?). Each byte takes 11 bits with 8N1 framing so you need to send 22,000bps"
OP wants to sample at 1E4 sample per second, leading to 2*11 *1E4 = 220, 000 bits per second (2.2E5). computed a 80 000 baud rate (usual value 115200). But OP sampling rate seems twice faster ... (or 2 LSBs are useless : then 115200 are enough). BTW binary sending is very difficult and unpleasant to debug (PC does not "know" when data begin -and can make guesses about the part of the 16 bits word-; sending only 8 bits -dividing ADC value by 4- can hide the need for synchronization). Edited : read post 30 :115200 is conservative with 8 bits (one byte) transmission. I am afraid it is not enough with 2 bytes. Close, 10 bits per character, 1 start + 8 data + 1 stop = 10 bits. I'm sure that is what you meant! No: I copied and pasted Clawson post #25, then recomputed with the same assumption (was 10 times overoptimistic if the way I read 10k SPS was right, a10% error could be neglected at this stage). Balau (I linked to) made a more realistic calculation . But that also applies to text. Well, if instead of quoting other people (making threads long and redundant, in a futile attempt to belittle OP ), one checked for *10 errors? But that also applies to text." text may begin at the next \n in simple (90%) trivial cases. "In both cases, you need some "overhead" to delimit values"
Yes, in the special case. Thank you all for your replies and sorry for my unclear requirements. My ADC knowledge is quite poor and UART knowledge is even worse so correct me if I'm wrong. 128 is just enough for me but it would be better to have faster (64). so thats why I left the 2 LSB out (and for make things simpler). With 8N1 framing I could send one sample in one frame, using 10 bits. so should I be worried about them? give it a try if I can transimit ADC straight without buffer. c) ASCII coded values has a limited number of chars, allowing error detection. Binary transmission cannot detect horrors. d) I bet I missed many others. Quite nice tip clawson I consider it and at the meanwhile try if I get it working somehow with the 16MHz crystal. The odd thing about ADC and the prescale setting is that it often helps to REDUCE the CPU speed to get a "better" value. Obviously the goal is to get the clock as close to 200kHz as possible (though you may find that 16MHz/64 = 250kHz is OK). So you really want a crystal that is a binary multiple of 200kHz. 200kHz * 64 = 12.8MHz in fact. So a crystal of that frequency or perhaps half (6.4MHz) could be a good choice but you also have to weight that against the requirement of a fast/accurate UART speed. So the 11.0592MHz is possibly the best choice in the region of 12.8MHz.